Firefox Stable and Beta versions cannot override add-on signing anymore which means that users cannot install unsigned add-ons in those browser versions. A switch was provided up until now to bypass this, but it will be removed with the release of Firefox 48. Firefox ESR, Developer and Nightly editions ship with the override so that unsigned add-ons can be installed. This posed a problem for add-on developers who wanted to test add-ons in development against Stable and Beta versions of Firefox. Simply speaking, with the restriction in place, they could not do so anymore without getting the development version signed first. This however is not practicable for a number of reasons. First, any new version, and there are usually plenty during development, would have to be signed. Second, add-on signing adds to the development time. The official Extension Signing page lists download links for unbranded Firefox builds. Currently, only beta builds and development releases are available, but the first unbranded stable version of Firefox will be made available on August 2 when Firefox gets updated to version 48. Unbranded Firefox builds are provided for all supported desktop operating systems. Mozilla suggests you create a new Firefox profile for those unbranded builds to avoid any complications. Furthermore, a bug plagues these first builds that is rather annoying if you notice it too late. Basically, it can happen that these builds are updated to release builds of Firefox automatically. Setting it to false prevents automatic updates. This does mean however that you need to download and install new unbranded versions of Firefox manually for the time being. Also, unbranded builds show up as Nightly instead of Stable or Beta when you run them. Setting the preference to false disables the add-on signing requirement. 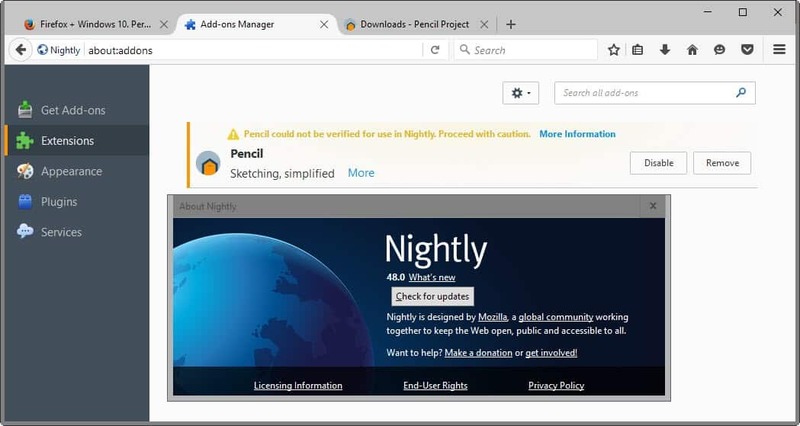 Mozilla released so-called unbranded builds of Firefox Stable and Beta recently that allow users to disable the add-on signing requirement. LOL… Hasn’t Mozilla repeatedly said that developers have had more than enough time to get ready for various changes? Mozilla’s M.O. : Do as I say, not as I do. What useragent does the unbranded browser send? They also should create “unbranded versions” specifically for their users to test ads, telemetry and other similar (•̀o•́)ง in, they can using it without having to see this is Firefox doing this. And what about Android? Where is the unbranded version for Android? Or will they keep the xpinstall.signatures.required pref available for the Android version of Firefox? After further exploration into it, I’ll probably end up using an unbranded build as my default for personal use (other builds for other things), and I suspect that others will too. The User Agent should be different. At least for statistical purposes. How would one self-build the unbranded version? Must you download sourcecode for stock firefox v48, then download “mozharness” from the FTP site linked to the wiki page regarding unbranded versions, then extract/overwrite contents of mozharness into the source tree? # These packages are needed for mozharness unit tests. # Output from ‘pip freeze’; we may be able to use other versions of the below packages.